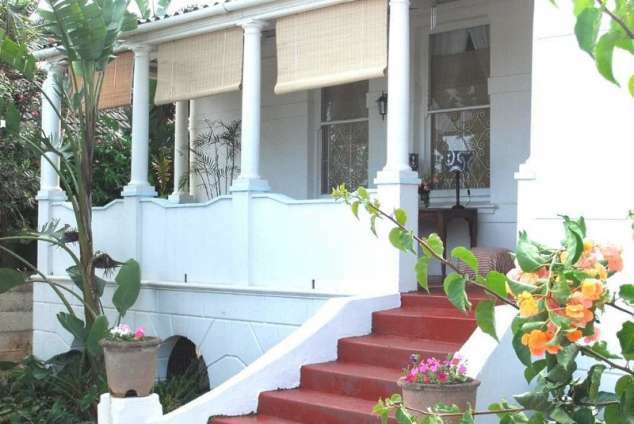 Pastel Guest House - Musgrave, Durban Accommodation. Situated high up on Berea, below Musgrave Centre, with views over the CBD towards the beachfront in a peaceful, secure cul-de-sac road lined with samples of architectural listed buildings, this 110 year old house boasts clean wooden floors, high ceilings, beautiful old furniture in four neat rooms, large sash windows, white curtaining and linen allowing natural sunlight and air to fill the airy rooms. This room is a spacious large room, and consists of 2 luxurious single beds of extra length. Includes an en-suite shower. Sleeper couch is available on request for an additional child. Fully fitted communal kitchen available. Free Wi-Fi available. Super large room with en-suite shower, 2 luxurious single beds of extra length. Any children or 3rd adult on sleeper couch. Fully fitted communal kitchen available. Free Wi-Fi available. Very large room, non en-suite bathroom facilities available exclusively for this room. 2 luxurious single beds of extra length. Children or 3rd adult on sleeper couch. Fully fitted communal kitchen available. Free Wi-Fi available. DSTV, free wireless internet, flat screen TV's, coffee and tea making facilities as well as a fully stocked communal kitchen, plus view verandah makes this the perfect place to stay with a comfortable homely energy. Centrally situated to all amenities, this serviced home is truly a home from home for its guests. Special long term rates considered. Bed and breakfast rates and laundry service on request. Suncoast Casino and Entertainment World is only 3.7km away from Musgrave. Just before the arch bridge on the N3 take M13 Berea Road off ramp, (Kingdinuzulu Road), pass Musgrave Road, then turn left into Currie Road, then 2nd Right into Botanic Avenue Road, then take 2nd left into Halford to number 46. Call 0312016809 on arrival for assistance. 356 page views since 25 Jan, 2019. Last updated on 25 Jan, 2019.